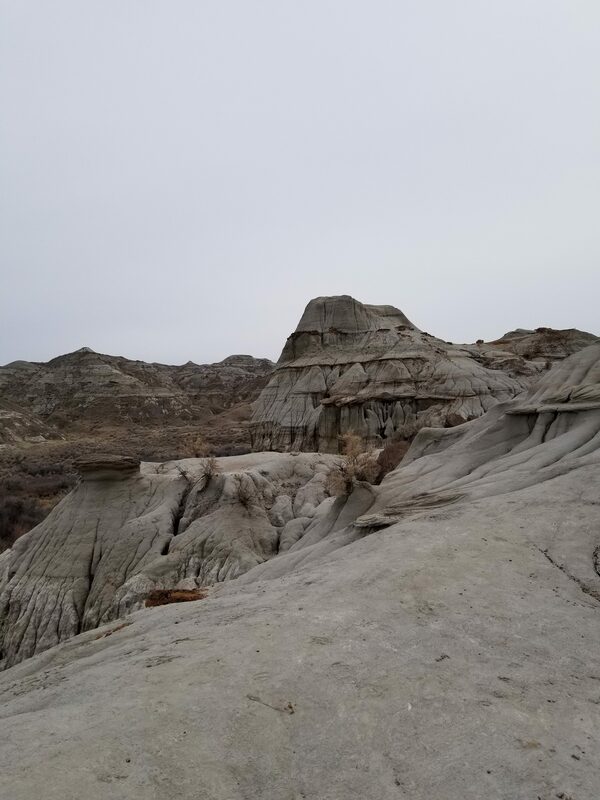 Alone in the Canadian badlands, where silence reigns supreme and winds are high at the base of mountains or on top of them, an irrational fear of what might be lurking in the shadows crosses my mind for a fraction of a second. But a glance to my right reveals the watchful form is nothing but a crack in the rocks—a pipe large enough to be felt as a presence in my peripheral vision. 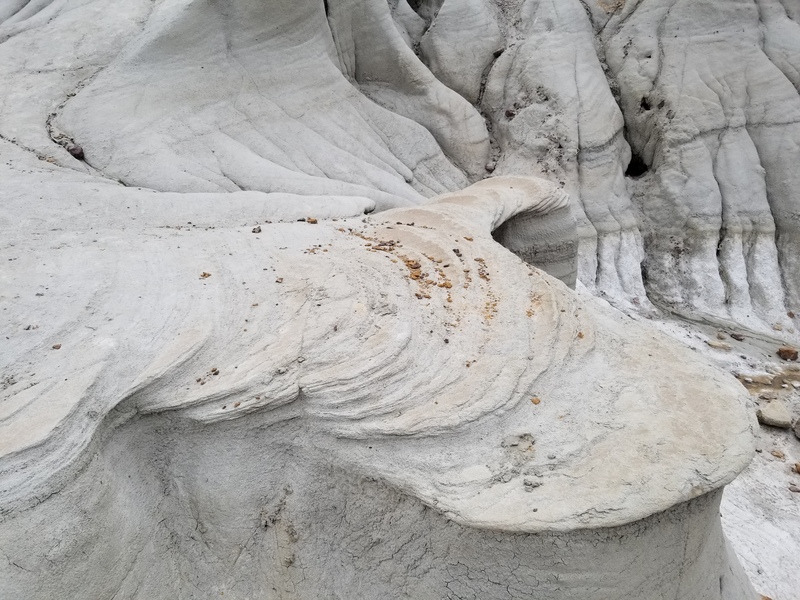 Ghosts of rains past make themselves known as rills in the rocks, lines embellishing sides of mountains that in some months or years, will no longer be. The environment is harsh; the weather works in extremes. But there will always be those organisms that push through and live, despite the hardships they must endure. Small trees can be seen growing through cracks in the barren rocks, a metaphor for difficulties and overcoming them in human life. Climbing among these rocks, I don’t know where I’m going. 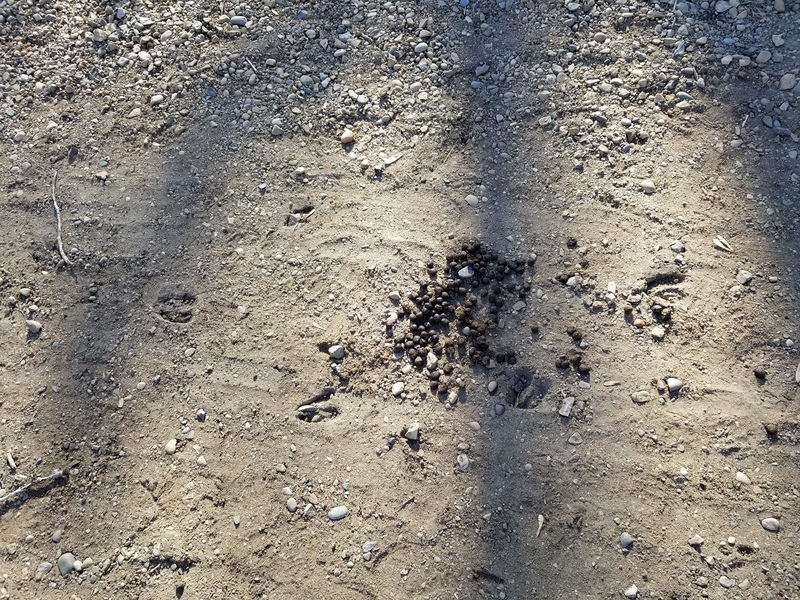 A trail is not clearly marked, despite fallen signs that scream, “STAY ON DESIGNATED TRAIL.” So, like those before me, I explore the area, though I do not discover the bones of ancients beasts. 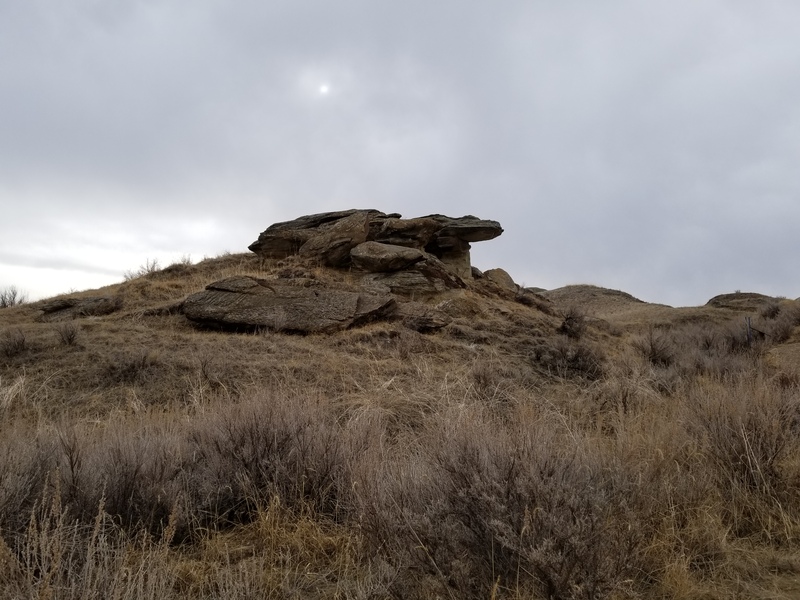 I do observe beautiful rock formations and read interpretive panels that make this exploration not only a feast for the eyes, but a lesson in history, geography, and geology. 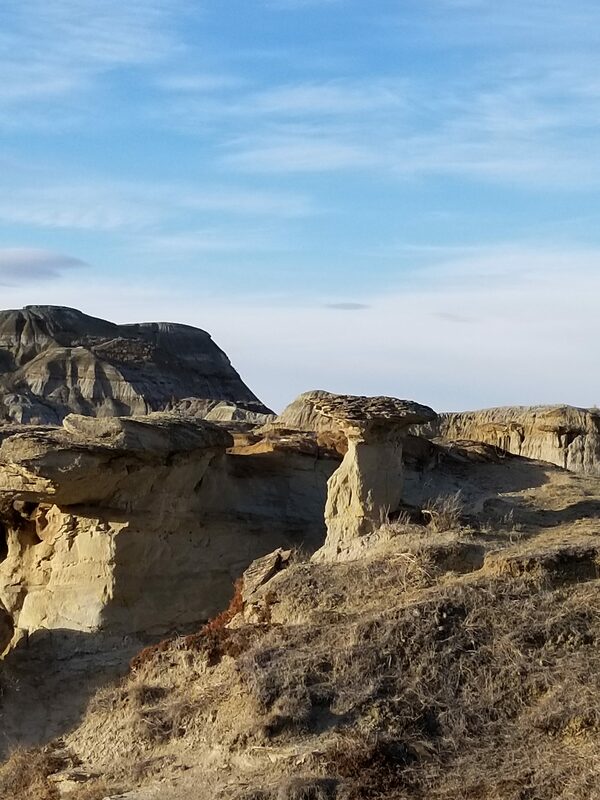 Dinosaur Provincial Park is a UNESCO World Heritage Site, and so named because of the many dinosaur fossils discovered here. 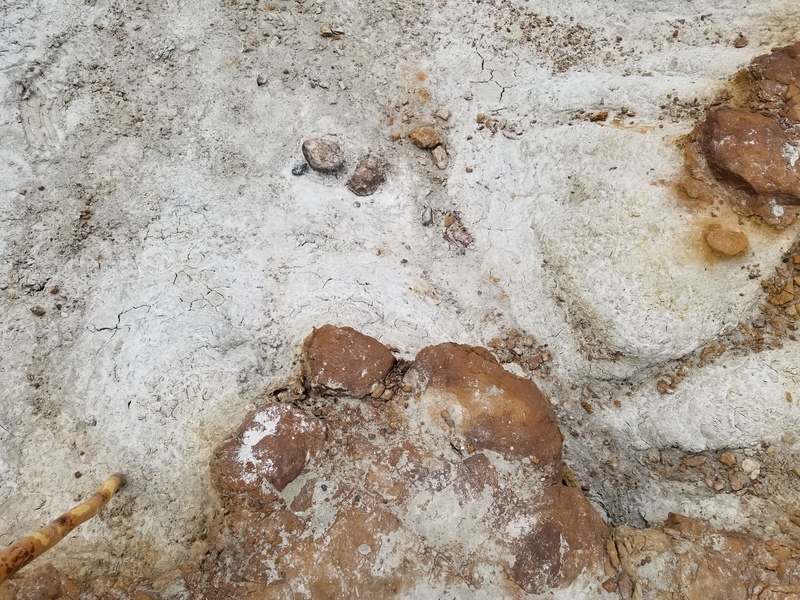 As I walk among these rock formations, even the rocks remind me of dinosaur bones and footprints. 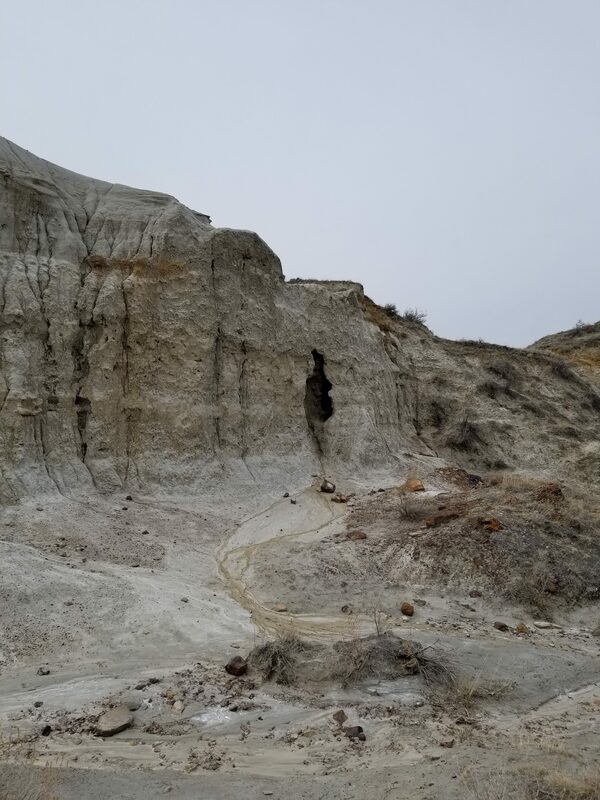 Over 150 complete dinosaur skeletons have been found at Dinosaur Provincial Park, and this number does not include the several pieces of individual bones, plus fossils of many other species—as many as 450 different fossil organisms. 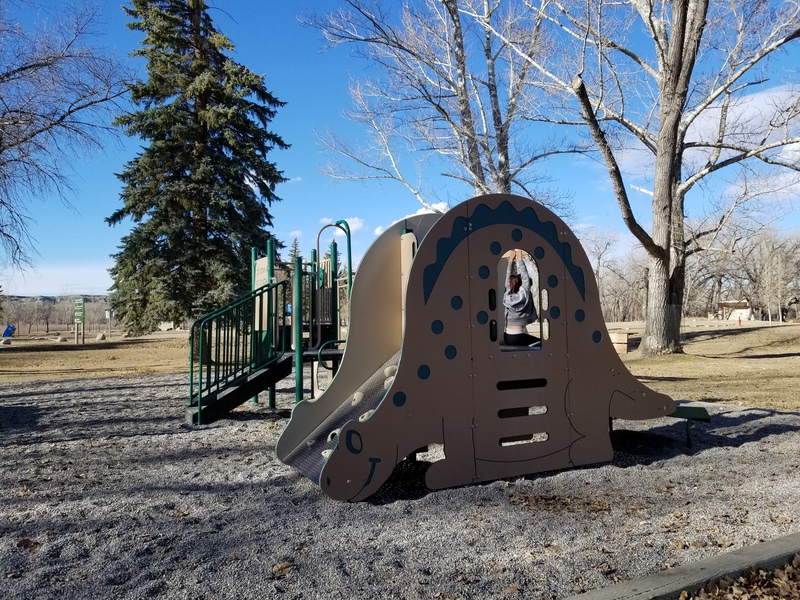 This park is a wonderful destination for children and adults alike, whether they are obsessed with dinosaurs or simply interested in science, history, or geography. But the learning opportunities in this park are not the only attraction. 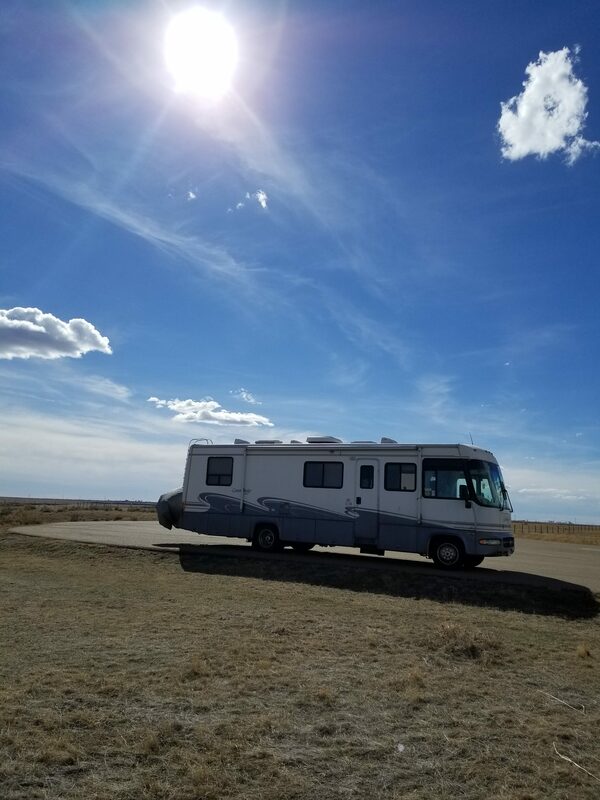 The campground is peaceful, quiet, and at night, the stars come out in all their glory in the dark, clear skies of Alberta. During the day, a playground and hiking trails beckon the playful and adventurous. 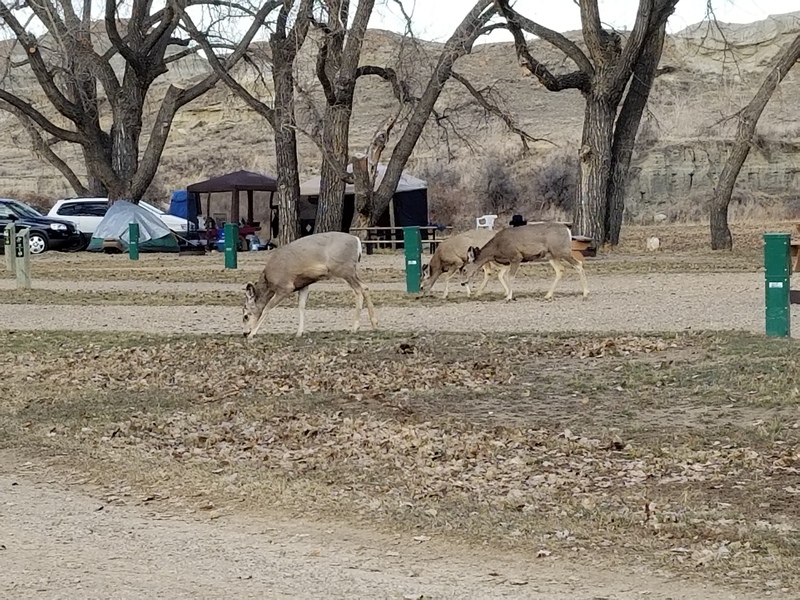 The campground is available year-round and electricity is available at each campsite; however, water is turned off during the off-season. You can still get water near the camping kiosk if need be, and the dump stations are always available. Before leaving the park, a stop at the Visitor Center is a must. There is a modest fee to enter, but it’s well worth it. The gentle giant has no chance against the pack of small but vicious creatures who want to feed upon it. 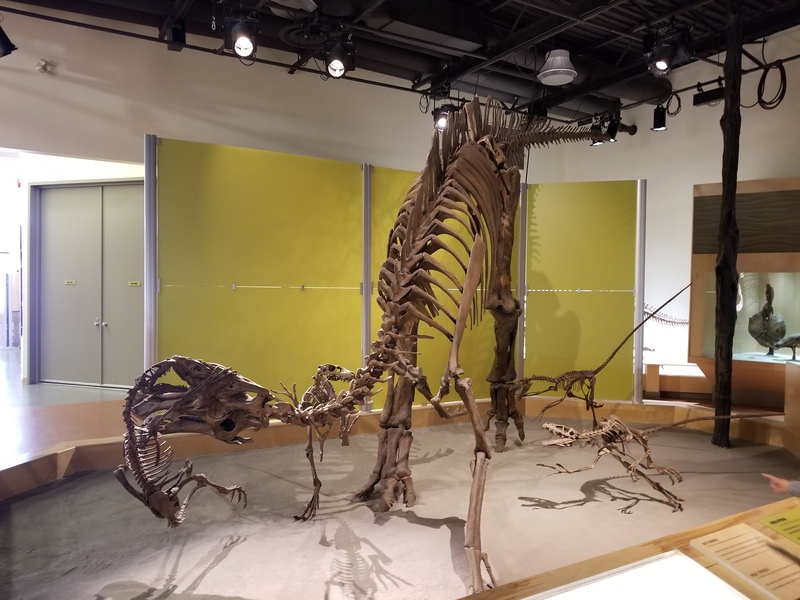 The hadrosaurs stands no chance against the four dromaeosaurus who leave bite marks on his tibia—the spacing and depth of which inspire this display. 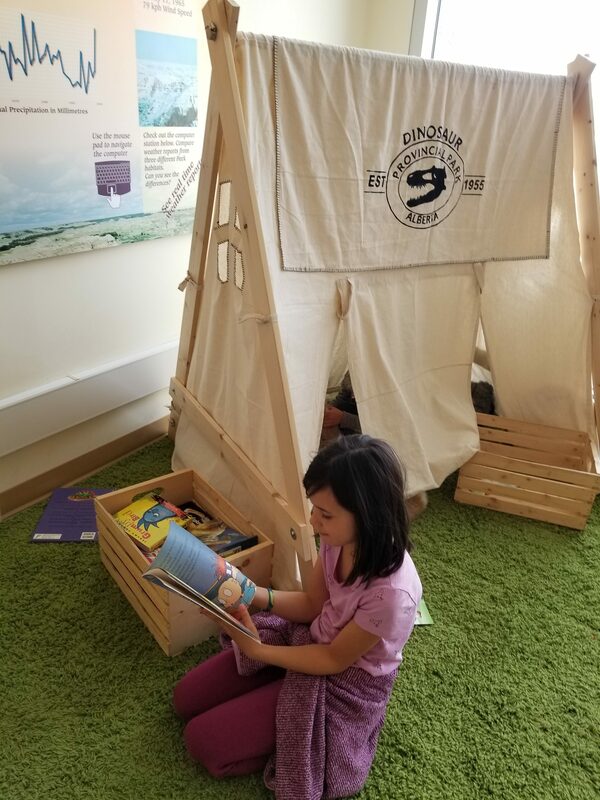 Over 100 years of research has gone into the study of dinosaurs, and what was dubbed the “dinosaur rush” in what is now known as Dinosaur Provincial Park has provided us with amazing displays of fossils, not only of dinosaurs, but of extinct reptiles, crustaceans, and plants. 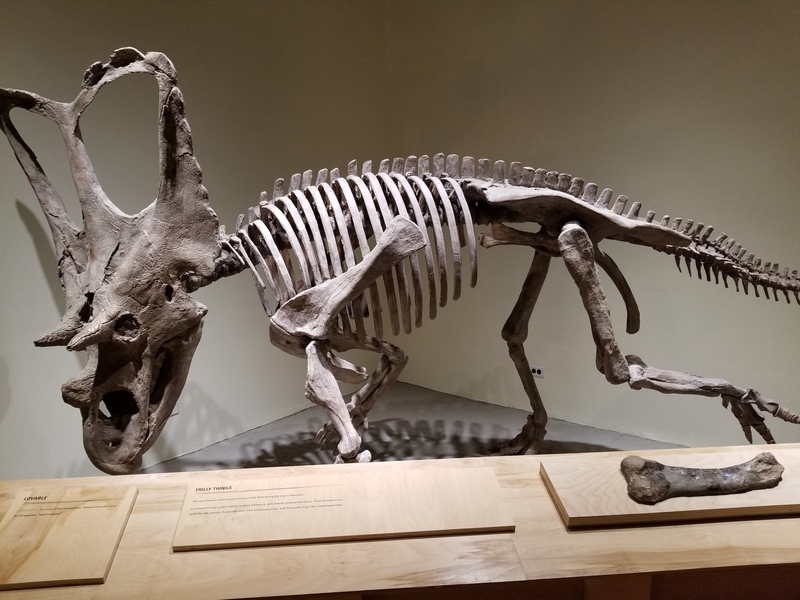 The many fossil displays are interesting and awe-inspiring for adults and children alike, but there are special treats for the children. 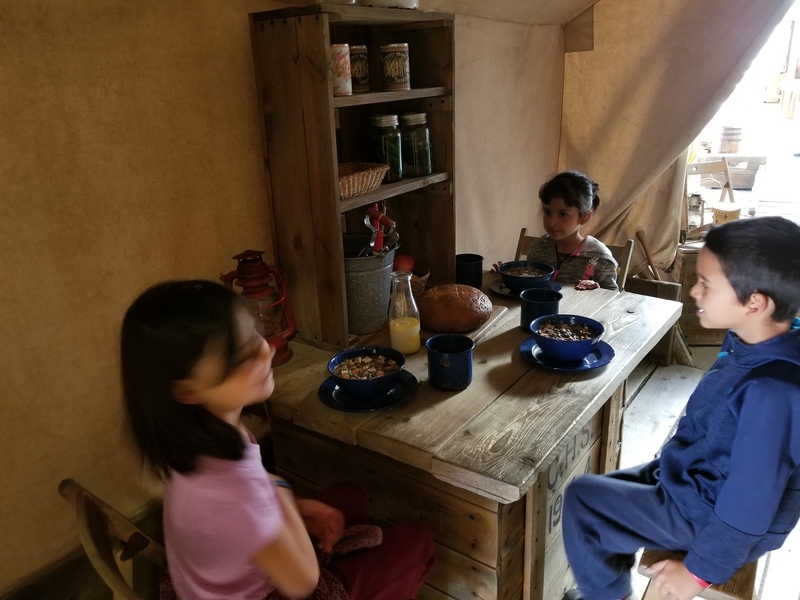 Our kids especially enjoyed being fossil hunters back when this park was first being explored. 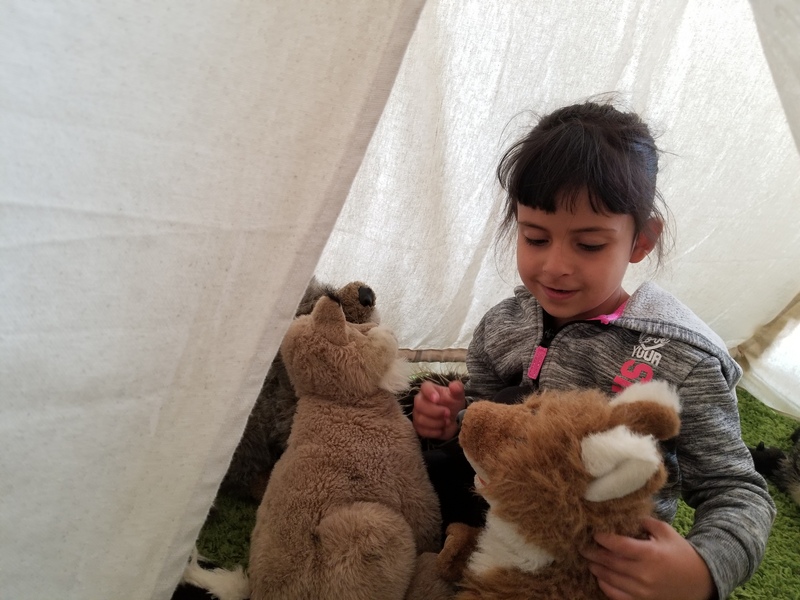 And both our bookworm and our stuffed-animal lover found a cozy place to spend a few minutes after looking at the displays. 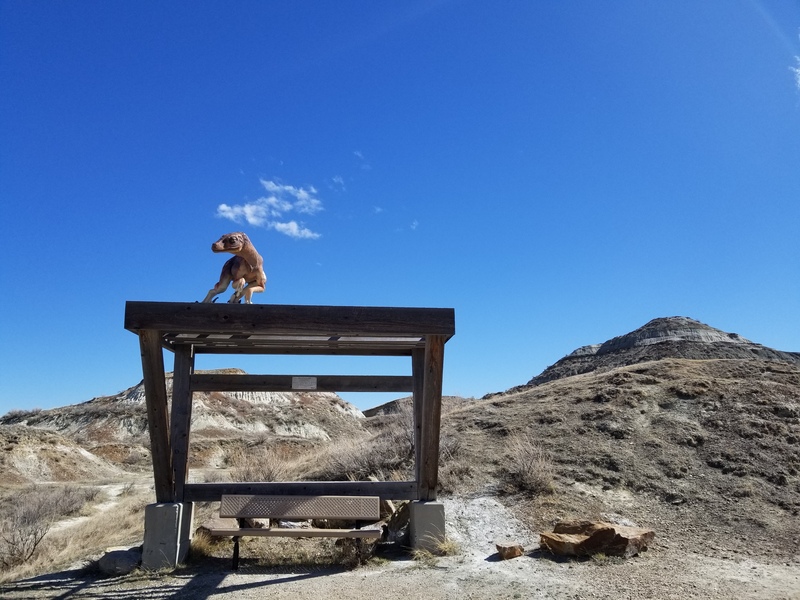 Dinosaur Provincial Park has a lot to offer, from the silence of its campground, to the interesting information and displays at the Visitor Center, to the unique landscapes of the badlands, coulees, and more. 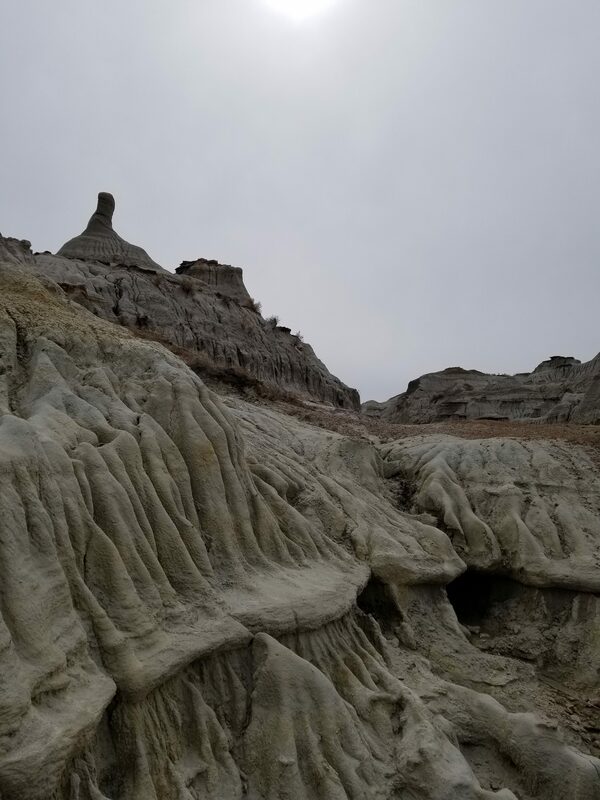 Perhaps my favourite aspect of the unique landscapes were the interesting formations in some of the trails I walked. 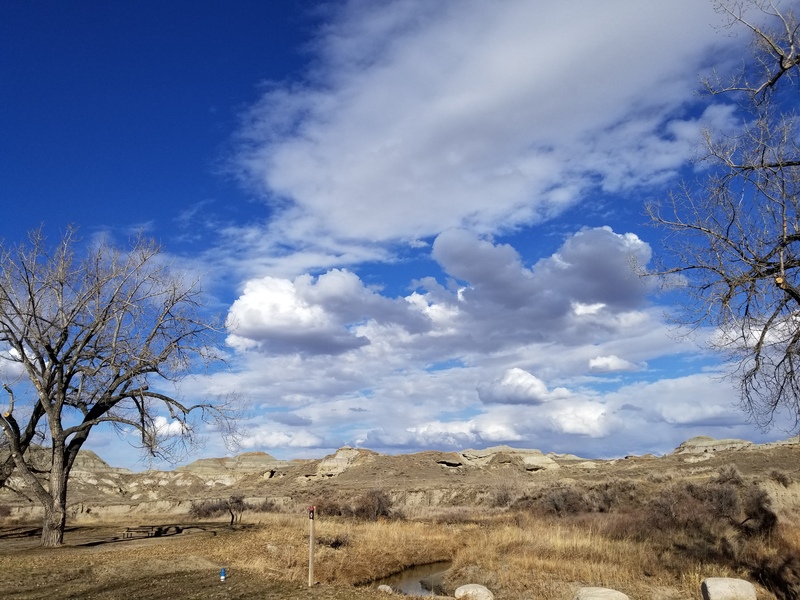 And of course, Alberta’s beautiful skies are always a treat for the eyes, here at Dinosaur Provincial Park, or anywhere in the province. 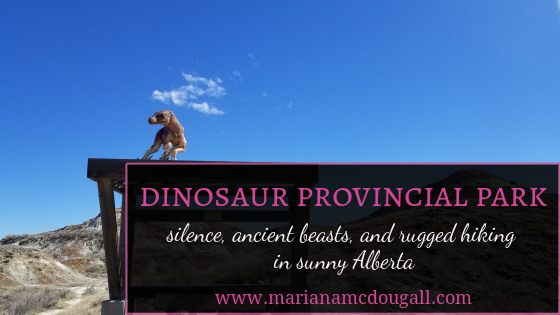 We really enjoyed our time at Dinosaur Provincial Park, and definitely recommend a visit if you are looking for a quiet place to camp, beautiful skies, and if you would like to learn more about paleontology, geology, geography, history, and more. 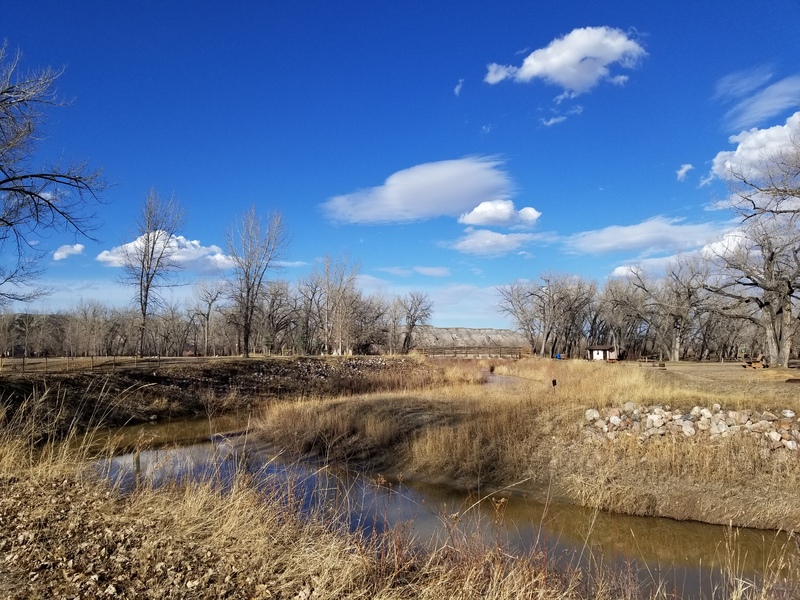 It’s an excellent place for nature studies in general as well, since you can see plenty of wildlife and/or evidence of its presence. As an example, on our first night at the campground, we got to see some beautiful deer, fairly up close. 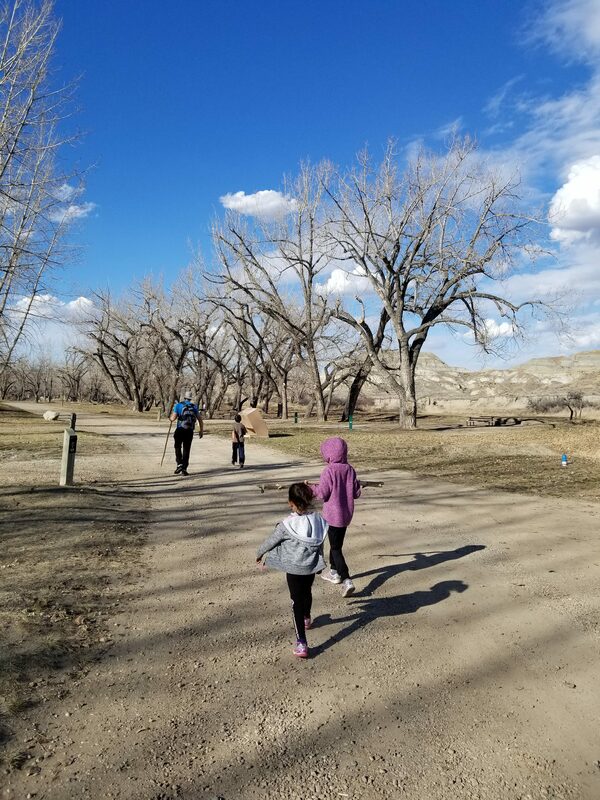 We all enjoyed walking around the park, checking out displays at the visitor center, looking at the unique landscape, and enjoying the silence in the evening. We did have a couple of campfires, but the winds were so high that they weren’t anything to write home about. The scenery, however, deserves a few more pictures on the blog, so here you go. 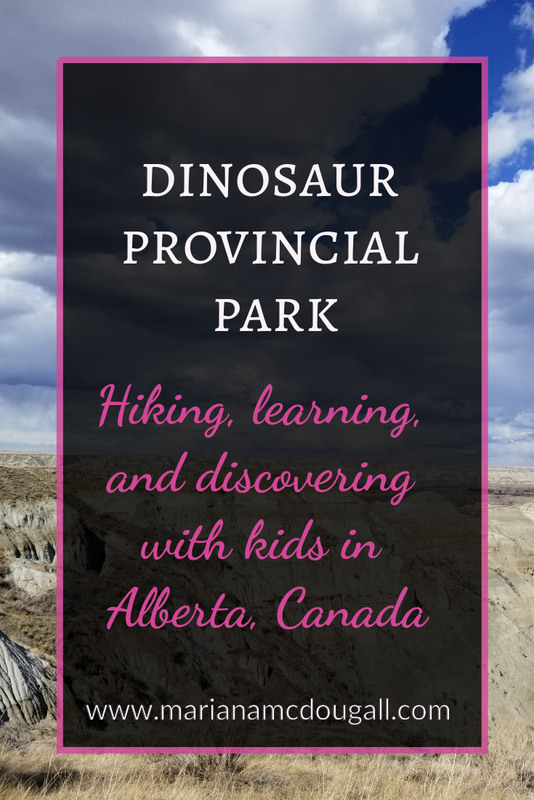 We have now been to two Dinosaur Parks: Dinosaur Valley State Park in Texas, and Dinosaur Provincial Park in Alberta. 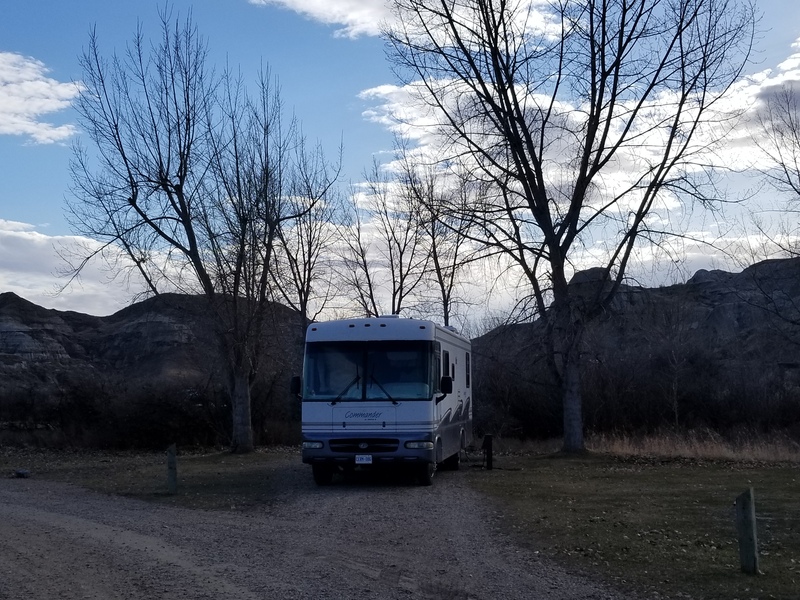 I loved both of these parks for everything they had to offer, but I must say the Visitor Center at the Alberta Park was pretty neat, and the beautiful silence of the campground makes me want to return some day. I think both of these parks are worth a visit. 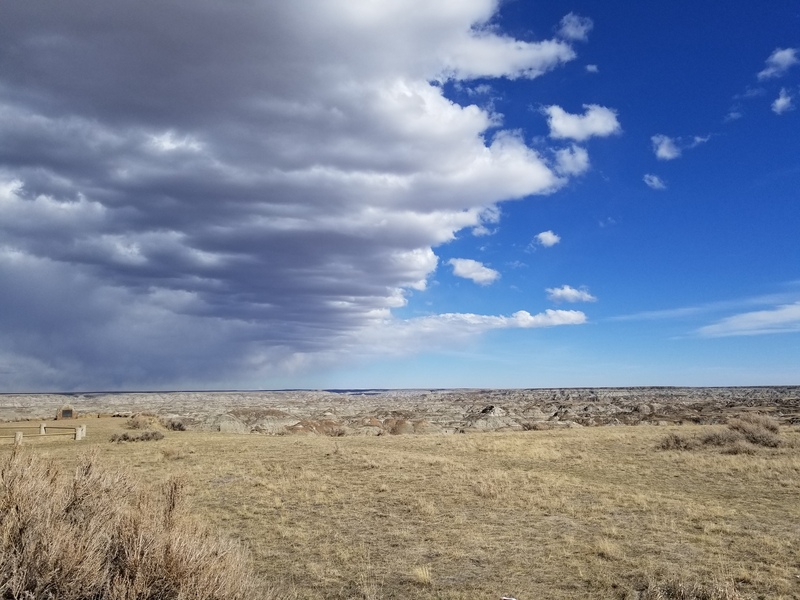 Have you ever been to either of these parks? What was you favourite thing about them?